Market Entry cases often involve strategic questions such as: ‘Your client Company Z is currently manufacturing and selling coffee machines. It is now considering to enter the microwave market. Should they do that?’ In some cases, the answers to these questions are simple YES-or NO-answers, but in other cases the client might also want to know HOW to enter a specific industry or market. Either way, both questions follow the same structure in the beginning. 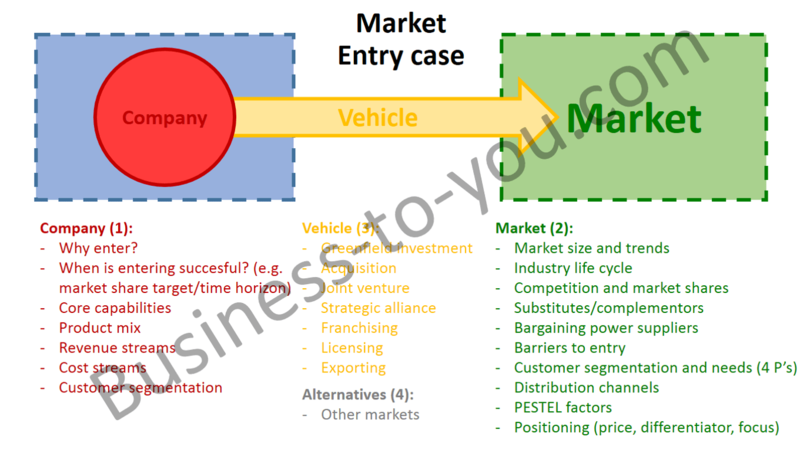 The market entry framework used in this example covers a company characteristics analysis, industry analysis and an entry-mode vehicle selection. You want to start off with some general questions about your client’s company. Why is it that Company Z is thinking about entering a different market? Do they have excess money to invest? Is Company Z’s current business stagnating? Or are they simply looking for new ways to grow? By asking this question you will find out more about the motives of your client. Secondly, you could ask when entering a new market is considered successful? Is there a certain market share the company wants to conquer or are they already satisfied when their business would make a profit in the first year? Answers to these questions would make it easier for you to quantify the case objectives in terms of market share (% of the total market size) or profits (expected revenues−costs). If needed you could also ask about the company’s current business (e.g. core capabilities, product mix, revenue stream, customer segment). It would for example help if Company Z’s current customers have overlap with the customers it would be targeting when entering a new industry. Don’t take too long for these kind of questions, but do make sure that you have a good impression of what your client looks like. This is the main part of your analysis. Here you want to determine how much potential the industry your client is thinking about entering actually has. You could start off with the market size. In some case interviews, they will ask you to estimate the size of the market yourself. This could be done by multiplying the amount of customers in a certain area by the average price of a product × the average amount of products that are being bought a year by a single customer. In addition, it is very important to ask about trends: has the market size changed over time? In what life cycle stage is the industry at the moment: emerging, mature, declining? You don’t want to enter an industry that is already declining massively. Next you could ask about the major players in the industry: the competition. 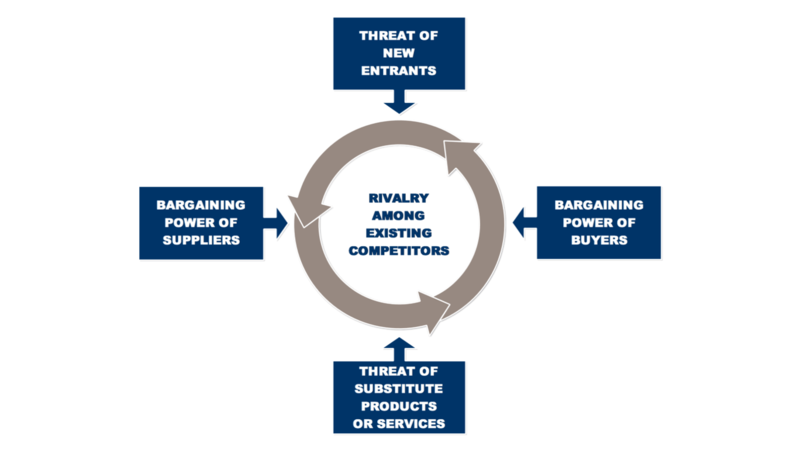 Is the industry consolidated (a few large players) or fragmented (many small players)? And how are all players differentiated from each other? Don’t forget to also take into account potential new entrants, substitute products, entry barriers and supplier power. A great framework for this part of the analysis is Porter’s Five Forces. Consequently, you could look at the customers. What are their needs and how loyal to existing brands are they? Is Company Z able to capture some of these clients from rivals in that industry? This is also where you need to think about positioning Company Z in the current competitive landscape. As extra option you could also do a quick PESTEL Analysis to determine what macro-environmental factors could affect your business in the long term. In case both the company analysis and the industry analysis above turn out to be favorable for a market entry, your client might want to know HOW it should enter the focal market. There are multiple ways in which a company can enter a new market. During an interview it is often enough to mention the three most common vehicles: starting from scratch yourself (greenfield investment), forming a strategic alliance or joint venture with a local player, or acquiring a competitor in that specific industry. It is important to know the pros and cons of each vehicle compared to the other options. An acquisition for instance is a faster market entry vehicle than starting from scratch yourself. A drawback of an acquisition however is the integration process and possible cultural clashes. A strategic alliance would sound like a great middle ground alternative. However, even with strategic alliances there can be cultural clashes and so called learning races. For a more exhaustive list with pros and cons of organic growth, acquisitions and alliances, you could look here and here. 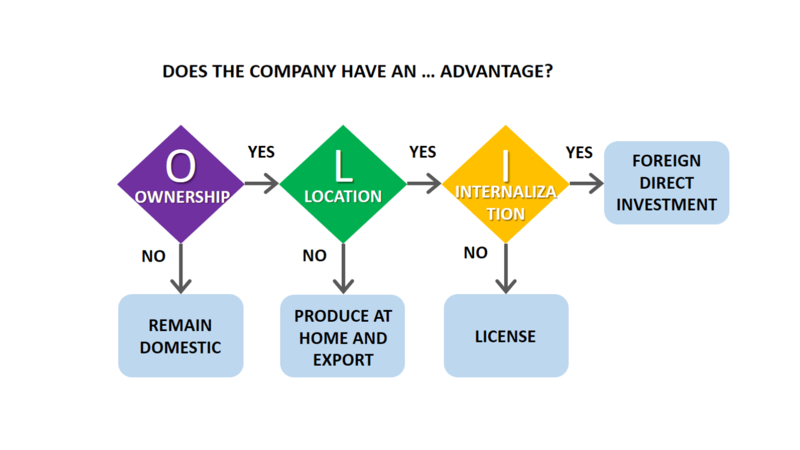 Other entry-mode strategies you could consider are licensing, exporting or franchising. In order to decide between these options and foreign direct investment (greenfields, acquisitions and joint ventures), you could use the Eclectic Paradigm (or OLI Paradigm).